Things have come a long way since last year’s E3 for Czech developer Warhouse Studios and their newest game, Kingdom Come: Deliverance. Then, I only got to see a small sliver of what it’s all about, and even at that moment Deliverance already sounded pretty damn ambitious. This E3’s presentation focused on going into more detail of what the game’s all about, and helped make it sound like it’ll be a tough contender to take Skyrim’s place as the busiest and most balls to the wall first-person medieval melee action-adventure experience. 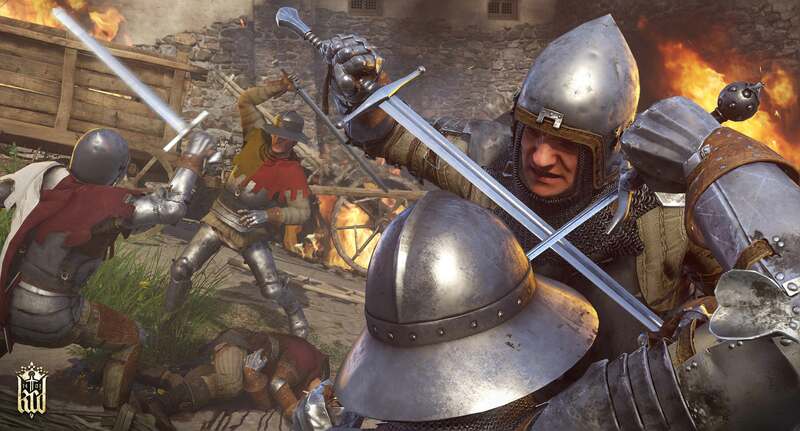 If you’ve been keeping up with the sword and shield side of multiplayer combat games over the past year, you’ve probably played a fair bit of Ubisoft’s For Honor; Kingdom Come has a similar type of combat mechanic, only it’s more involved — you’re given six cardinal directions to aim at for attacks and defensive moves instead of For Honor’s three, not to mention the ability to use shields and ranged weapons — all in first-person. These elements all combined make for an incredibly immersive (and slightly overwhelming, at least initially) adventure. Kingdom Come: Deliverance wouldn’t pose much of a challenge to other action-adventure games if it only focused on deep combat, however. Much of the game’s story was fleshed out during that presentation, of how the world in Deliverance was modeled after ancient Bohemia wherein its ruler’s death has brought the once thriving kingdom to its knees through war and conflict. The protagonist, Henry, is the son of a blacksmith who sees his family and village get demolished by an invading force and ends up joining forces with a resistance group in order to seek revenge and reacquire a family heirloom that was stolen by the enemy, as well as save Bohemia, of course. The hands-on demo picked up right at the outset of Henry’s tale, as he’s tasked by his father to pick up a debt from a fellow villager who’s not too keen on being collected on. Other objectives were also available all over town, but I ended up focusing on getting the dough back from that jerk of a neighbor with the limited time I had to test Deliverance out. Things weren’t easy, though. For one, Henry wasn’t able to put up much of a fight when negotiations failed and he started to get his faced smashed in. Then, after walking back to the guy and trying to once again talk things over, Henry and I were once again pummeled. That’s when I decided that I’ve had enough and tried to sneak into his house and plunder the goods myself. In true open-world fashion, I ended up getting caught red-handed, with the town guard chasing me out to the surrounding forest. After my failure as both a warrior and as a thief, I took it upon myself to try and at least get a little better at fighting by jumping into the other section of the demo, where I was able to jump into an arena and test out a few different weapon configurations. That’s when I figured out a little more the apparent mountain of depth that this game’s combat seems to want to have me climb, such as keeping track of stamina bars — yes, there’s more than one, and they drain up if you continuously wack around a sword aimlessly — and even combos. Unfortunately, I was not able to keep going and further study up more techniques, but for the moments that I did try and get a little better at fighting, I did feel like I was slowly getting into the groove of things. Deliverance demands much more finesse than the usual swordfighting game, and in that regard, I’m definitely interested in diving in once the final version is out. It also helps that there’s an entire story that takes place in a time in history and geography that are not usually seem in games, with an amount of care and worry about fidelity to boot. I’ll be keeping an eye on this one for sure. Kingdom Come: Deliverance will be out for PlayStation 4, Xbox One, and PC on February 13th, 2018.